Ok, if it's meant to happen let it happen. Have you found an alternative web site to substitute wunderground? Please make Autocad Civil 3D and Archicad work on Linux! Alright, we'll see when the time comes; if there's an alternative there is hope. ^ Via my API key I get the weather information of a PWS near... They are very accurate. Accuweather have changed the layout of their forecast pages for US locations; the 1_accuweather script had to be updated. Furthermore, the kill command that was used to pause and resume conky while the script was downloading weather info has been replaced with the more flexible pkill. Pkill can pause only the particular conky instance that uses the script and not a totally random one as kill did - people who were running multiple conkys were constantly complaining. Read the 1_README.pdf file for details about what to do to take advantage of it. Script rebundled; thanks to unklar, ipdeman and seatommyboy for their valuable feedback. Cheers chepioq, I hope it won't be needed at the end. maybe a better alternative because non-commercial institutional site. i also found out that my favorite http://fmi.fi/ offers open data in XML documents to download for free: https://en.ilmatieteenlaitos.fi/open-data-manual but i have very little idea (yet) how to use it. ...I have a reason to be optimistic, as I've explained back when I made the latest wunderground script. Take this page for example. It shows the weather for my hometown. This is a strong indication that d8585d80376a429e works like a universal api key and unless they change their main forecast pages it will continue to work and provide a valid forecast. Thank you for this info, when my API key will be deactivated I will test this key. You should always use the latest version of the script. Theo wunderground since today don't work with my API key but it work fine with your . Is that the same any one ? same for me, my api key don't work but work with the generic api's key. Yes, that was the meaning of the 2018-6-24 update: rewrite the script using what appears to be a master key. To all users of the 2_Wun script: if you haven't yet updated to the latest (2018-6-24) version, now is the perfect time to do so. Thanks for all the work on the scripts. Been running multiples (via cronjobs), one with a US location running the new script. As with non-US locations, when the first-days file changes to evening/night, line 4 changes from a temperature number to the term <Lo>. This "symbol" doesn't appear during the day when line 4 pulls in a temp number instead of the term <Lo>. 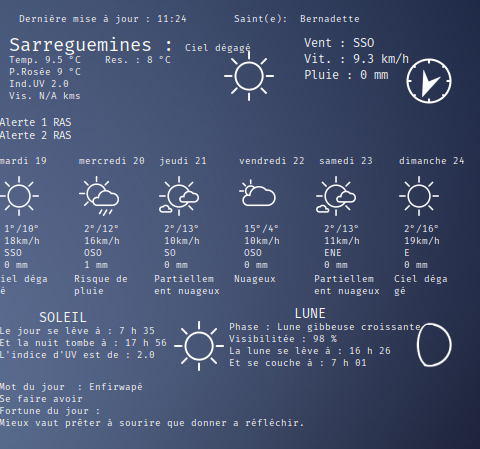 I haven't modified the script, or the first_days file, and the sed call in the conky is clean, without spaces or any intentionally inserted symbols, and this symbol doesn't appear in the <Lo> display with the non-US locations using the old script. accuweather displays the "Lo" sign after a certain time in the evening. This is not an error. What unklar said bansurveillancecapitalism. Try adding that line in your conkyrc and see if it solves the issue. Wood is considered to be very trustworthy here... and, I'll do that.